It was the steam trains that opened up the country like never before, shortening continental travel from weeks to days as they quickly sped coast-to-coast on silvery rails, spewing trails of black smoke, hissing steam and blowing a warning whistle heard miles away! 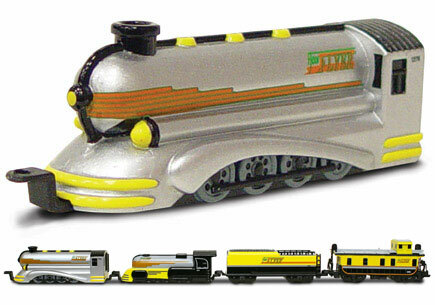 This Floor Flyer 4" diecast metal train rolls easily on the floor with its hidden wheels. Not for children under 3. ©2008 J. Lloyd International, Inc.